I’m swatching. For a new project. Wendy’s iPod sweater. 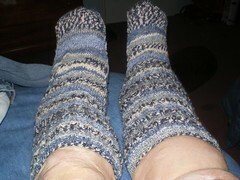 My socks are done (pictures when I put batteries in my camera). I’m making headway on my summer projects. I can play a couple chords on the guitar. I’ve driven around the neighborhood at a glorious speed of fifteen miles per hour. I only have three hundred pages left in the huge book i want to finish. It’s been a pretty productive day. Add to that, two more skeins of yarn to use up before I start my Central Park Hoodie all makes me a happy nose-pierced knitter! I just binned a pair of socks. The socks I knit last summer, the blue ones that I like very much. They are very soft and have lovely colors. And many holes. Those socks travelled with me to Europe. I should keep them for sentimental value. But I can’t. Because they have irreparable holes. I am considering buying more of the yarn and reknitting them to make myself feel better. Yeah binning is a lie. they’re going in the back of my sock drawer. You are not a process knitter. Please keep that in mind when you try to cast on socks without checking gauge. All sock yarn is not the same. Hell, your needles weren’t even the same. Do not think that you will have the patience to unravel or *shudder* cut the toe of your sock to fix ANYTHING.. You won’t. Will Not. You also will not (got that) put away this yarn and move on to the pretty new blue yarn you bought in Pennsylvania. You will meekly cast on a gauge swatch (though it is okay if you want to use the untouched ball) and restart these socks. And if you’re still knitting them during finals, you will have learned your lesson. These socks are knit from the yarn my LJ Secret Pal sent me (thanks Lauren!). 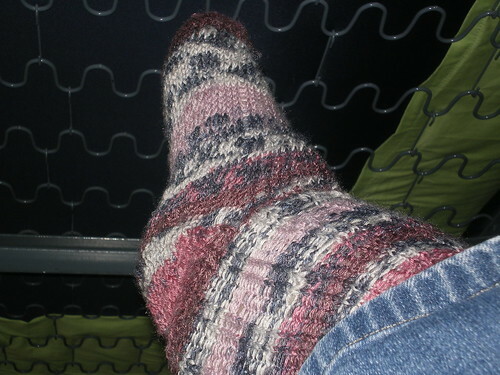 They’re knit in Knitty’s toe-up pattern, exactly, but still a little loose in the foot and the heel’s long. I think I’m going to try a backwards flap heel next time. Still, they fit. Poor darlings were so streatched out after I wore them yesterday though! Next up is finishing the scarf I started before Europe, and then swatching for Wicked! How about that time when I FINISHED MY SOCKS! That’s right, you heard me, the socks of forever are DONE! 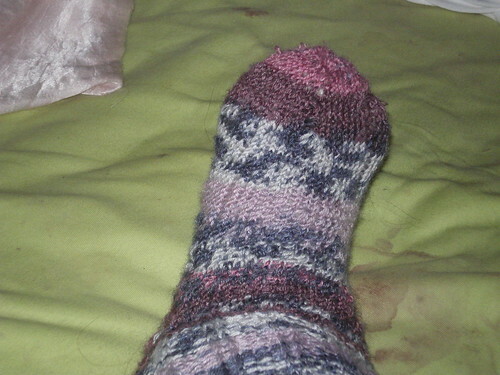 Ladies and Gentlemen I have knit my first socks for myself! (my first socks were actually for my best friend Carly). I’m seriously excited just to have done these and have them fit, but I do have some pattern notes. Notes: I knit them too big. They fit, but the slide down on my legs and the heel on the left one sticks out of my shoe :-/. When the pattern says multiply by .9, multiply. The socks has been measured to your foot, it is not going to make it not fit. I promise. Also, my Socks on One String technique works well, but remember with a pattern like this knitting from the opposite side of the ball will cause it to reverse as seen in the top cuff of my right sock. I also wasn’t nuts about the yarn, it split easily, and in the end I somewhat dislike the colors and the gray bits…. but it is cheerful! Aside from all of that, I am enamoured of sock knitting. 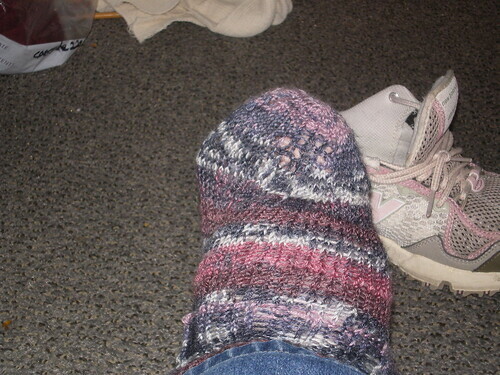 I found a couple balls of sock yarn in my mom’s stash and will probably steal one to make more that actully fit soon. And these will be bed socks. Yay bed socks!!!! !